Wow, we can barely believe Gabfire is 5 years old! It’s been an amazing journey to work on some of the coolest themes on the web, but it’s been an even greater experience to build such a great community, we really wouldn’t be anywhere without you guys! This special would have been live a week or so ago, but the team’s been busy getting smashed in different corners of the world. We’ve accomplished a lot together, and really appreciate the love that you guys have shown us. This week-long theme special is our way of saying thanks for choosing Gabfire throughout all these years. What’s on the Roadmap for Gabfire? We’re refining and updating the Gabfire Framework and launching a theme next week titled BootStart. More on that coming soon. Dying for full access? We’re putting the final touches on the all-access subscription pass to our themes. Yup, get all of them for a small monthly fee. We loved the first Gabfire Widget Pack so much that we’re assembling another plugin for you – think Social Media! We’ve got a few more hands on deck recently so expect more cool stuff coming your way! It’s a Big Theme Sale – 40% OFF! We really can’t thank you all enough, so for the next 7 days we’re having a birthday sale: 40% all themes. All themes, no exceptions, 40% off the entire lineup. The sale only lasts until Friday, August 9 (Midnight EST), so take advantage of this offer before it expires (no exceptions). To purchase, just pick as many themes as you want and use coupon code 5YEARS at checkout for the discount. Thanks again! See you on the inside. 24 Responses to "Sale! 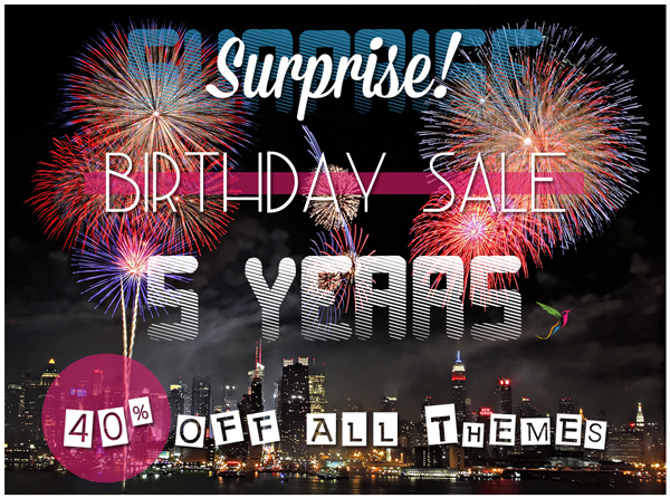 40% Off All Themes for Gabfire’s 5th Birthday"
Dogrudan email adresine bir cevap gonderdim Ilker. Congratulations, guys. Good work and thanks for share the celebration. Muchas felicidades, que vengan muchos años más. congrats and best best wishes for an even more splendid future! Congratulations with your first lustrum! Five years, wow! In WordPress terms that means that Gabfire Themes is a well established company. Hats off! You should send out emails when you have specials. I have waited a long time for specials and finally you have a sale but I am too late. Why do you not have a email newsletter list? We always send out emails to update our members on current campaigns. You can sign up using the registration form at the footer of site. Since I missed this sale, when are you having your next sale. I waited a long time so far but I cannot afford $79.00 for the theme.I am just starting out. What about a labor day sale? Waiting for fully responsive City Desk… Congratulations!